Tata Motors has bagged an order to supply Tigor EVs to Capgemini India.. Tigor EVs will be deployed at Capgemini’s campuses in Bengaluru, Chennai and Hyderabad . Tata Motors, today, announced the next milestone on its journey of driving electrification, through its partnership with Capgemini, to deploy Tigor Electric Vehicles (EV) in three major cities. Capgemini, a global leader in consulting, technology services and digital transformation, will deploy the Tigor EVs at its Bengaluru, Chennai and Hyderabad campus, reinforcing its commitment to a sustainable environment. Tata Motors has collaborated with Karthik Travels, a mobility solutions company to manage a smooth induction of the Tigor EV fleet into Capgemini’s transport ecosystem. 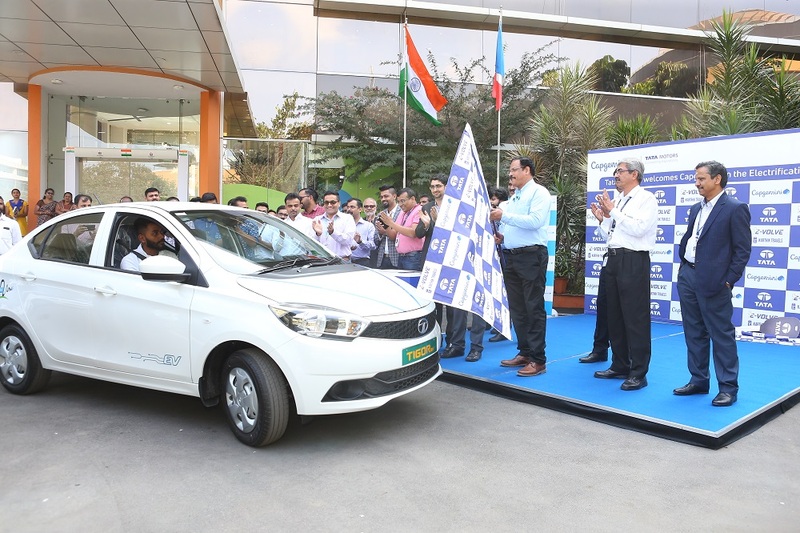 The first batch of Tigor EVs was handed over by the Tata Motors team to Capgemini officials, at an event held at the company’s Bengaluru campus. We are delighted to partner with Capgemini on their thoughtful initiative of promoting zero-emission vehicles for the employee mobility needs. Tigor EV, recently awarded as the ‘Electric Car of the Year’ by Assocham India’, will join Capgemini’s existing fleet of cars. Tata Motors will continue to work towards bringing aspirational e-mobility solutions for the customers, leading the drive towards faster adoption of electric vehicles in the country.